It is hard to have a flawless plumbing system. Pressure issues arise or the entire system just shuts down completely. It could be because of worn out parts in the faucets, substandard fixtures or poor plumbing. Whatever the cause, life becomes unbearable with a faulty plumbing system. One must therefore be equipped with basic skills than can help him troubleshoot and fix simple Plumbing Problems in Apache Junction, AZ. For that to happen, you have to take the following tips on common plumbing problems and how to fix them. Plumbing Problems in Apache Junction, AZ can include: Dripping Faucet. A dripping or leaking faucet is a clear indication that your washer has worn out and needs replacement. 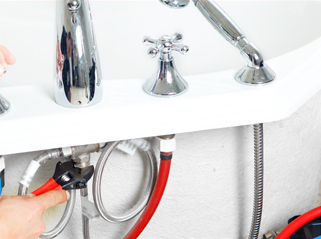 Since the seals of compression faucets are always under pressure, they wear out quickly. If they aren’t fixed on time, any of the following can happen• Water may be wasted • Fixtures may be corroded • Sink bowls may be stained. You don’t have to worry so much about the cartridge or disc or even the ball faucets since they are all washer-less. This means that they are less prone to dripping compared to compression faucets. To be on the safe side, choose a good, value priced faucet. Scaled up shower heads. Hard water and scaled up shower heads have a direct co-relation. The salt in hard water simply accumulates and forms a nasty layer on the shower head, making it hard for water to come out with the right pressure. There is a simple solution for this; use soft water. If you must use hard water, go for a shower head with a rubber faceplate. That way, you can easily scale and run off particles in the showerhead. Should that fail to fix the problem, detach the shower head then soak in white vinegar overnight. Then use a stiff nailbrush or toothpick to clear loose scales. This often has got nothing to do with poor plumbing. Examine the circuit breaker of the electrical panel to find out it has tripped, then reset it manually. If that does not help, check if your pump has a separate circuit breaker or a high limit manual set. If nothing happens even after these two measures, contact a reputable Plumbing Problems in Apache Junction, AZ company in your area.